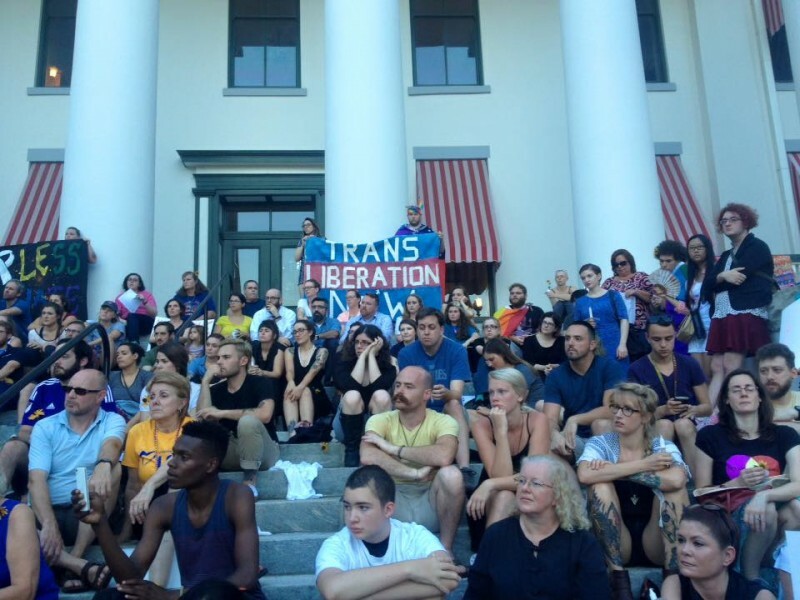 Tallahassee vigil for LGBTQIA people killed at Orlando’s Pulse nightclub | Fight Back! 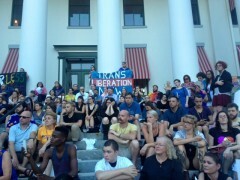 Tallahassee, FL - On June 14, close to 200 people gathered on the steps of the Old Capitol to honor the LGBTQIA people killed and wounded in a vicious homophobic attack at Pulse nightclub on June 12. Omar Mateen shot dozens of people in the club, murdering 49 and injuring more than 50. The massacre occurred on the club’s Latin Night that features talent from transgender women. Despite the claims by the corporate media, Mateen was not a practicing Muslim. Additionally, his ex-wife claimed he was abusive and his co-workers described him as dangerous. The vigil featured campus and community religious leaders, as well as speakers from several student organizations, including Florida State Pride, the Florida State University Muslim Student Association, and the Florida A&M University Dream Defenders. Participants held signs that read, “Queer liberation” and a banner that read, “Blame homophobia not Islam.” At the end of the vigil, the crowd lit candles as the names of the 49 people killed in the shooting were read during a moment of silence. Flowers and candles were placed on top of a rainbow pride flag. It’s becoming clearer that Omar Mateen committed these murders due to intense homophobia rather than religious extremism. Already politicians like Donald Trump and Hillary Clinton have began to beat the war drums and called for ramped up attacks in the Middle East - despite the fact that Mateen had no confirmed ties to ISIS. Mateen was a G4S employee, a private security firm utilized in the occupied Palestinian territories and prisons in the U.S.